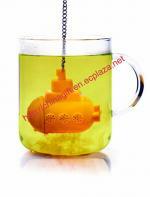 The yellow submarine tea infuser will take a tumble into the depths of your tea for the purpose of giving your beverage flavor and body. The submarine troop takes its mission seriously, and it will sink to the bottom of your mug to release your tea’s essence. Our company is specialized exporter, manufacturer and supplier of Submarine Tea Infuser in China.